Infinite Crisis has been gaining popularity as the open beta rolls along. I played the new map Coast City just the other day and had a blast with the developers as they showed me around. What’s great about this free to play MOBA is that they are continually rolling out new DC Universe heroes as the beta phase rolls on. Which is what we would expect with such a huge roster of super-heroes to choose from. 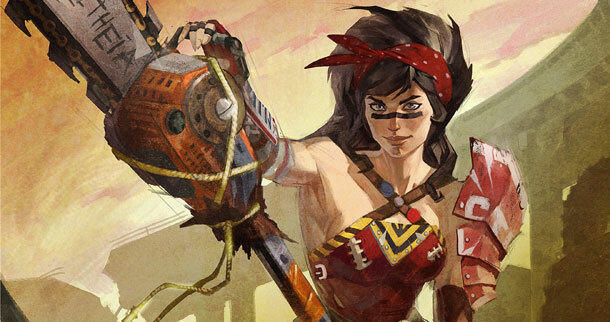 Today Turbine announces the latest champion to their roster on Infinite Crisis. Atomic Wonder Women, who uses her chainsaw of justice to carve a path to victory. Along with the announcement comes an introduction video which you can find below. If you’re interested in playing Atomic Wonder women you will have to wait until next Wednesday, August 21st when she is officially entered into the game. Players attending Gamescom next week will also get a chance to play with her in the new Coast City map at the Infinite Crisis booth in the Electronic Sports League Hall. Here’s a handy link to sign up for the closed beta, and also a Founder Program Pack link if you wish to purchase to get exclusive limited edition costumes and early access to the Coast City map.